STOP HORSE RACING!! It is a DIRTY SPORT as most are. There is money involved, cruelty, breeding of these horses and running them at such a young and underdeveloped age. Rotten, Rotten. Go to a casino!!!! Nothing that is living and feeling pain can be had there. 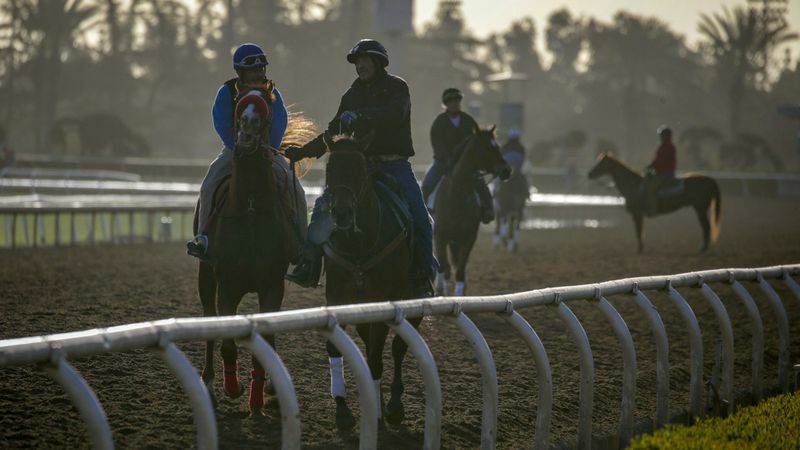 “But, Santa Anita used to have a whole series of races for 4-year-olds the following year. The auction market then was much more based on horses that would stay sound and race into their maturity. Now there is a collision of market economics, the breeders’ market and the sales market. What people want is a horse that’s going to be brilliant at 2, and win the Triple Crown.” MARKET ECONOMICS! That says it all. NO comment regarding the fragility of pushing 18 month old colts/fillies into training! No concern from the veterinarian they interviewed. Just: Lasix is safe! How many race horses (which would be geldings, of course) race into their 8-9 years – like John Henry? Dont hear of that, do we? Just received an email from the Buffalo Field Campaign – 150 buffalo sent to slaughter by the organization that “manages” them! This comment was made at the bottom of the email. Applies to ALL wildlife & their habitat! The attitude shown towards our wildlife is sadly not much different than that shown to domestic animals – if they dont turn a PROFIT – not worth being concerned with their welfare. ~ Prairie Protection Colorado, a wonderful organization working to protect prairie communities along Colorado’s Front Range. Learn more about their important work at http://www.prairieprotectioncolorado.org. For 25 years I’ve discussed the changes in body development on all breeds. Many unlike wild horses were manipulated to have finer leg bones smaller hooves and more machine smooth movement allowing premium usage until age 6 or so. Previously horses were bred as all around, good sized hoof, strong leg ones and hardy builds meaning they worked until they were into the it teens and beyond healthier, less injuries, and better prodigy. The reduction of sizes and the extra pressure to excel combined with more intensive training and coverup drugs changed racing permanently. Many other arenas had the same issues 4 the various breeds. That’s where slaughter said they would haul off the larger horses and cunningly recieved the breeders by encouraging breeding of easily injured horses which they would also often wish away to their painful fate. The old ways were better, yet we condoned the new ways. Change has to occur in breeding to make horses which are healthier, safer and live well for decades. Now I’m not knocking breeders I’m saying that’s where the maximum changes occur. The tracks just got conned by slaughters encouragement. Plain and simple. Off topic but is about wild ones. Anyone know any details on how these wild horses were being shipped to slaughter? Its lacking details and we all know they are not to ship so can anyone dig into this and find out how this occurred? Colts’… The ‘horse slaughter for profit’ is a mega-vulture enterprise that is thriving thanks to all the layers of corruption going on in the DOI, the BLM, and the racing industry. The kill-buyers are always right there, ready to swoop down on their prey, and often these creeps are also the owners of the slaughter “feed” lots, like the despicable Dennis Chavez in Los Lunas, NM. There is no lower scum on this Earth than these reptiles, except for the murderers at slaughter plants……. Wild horses with paperwork (BLM ownership papers) can and are sold for slaughter all the time through normal loose horse auctions. Once you have ownership papers they are no different then any other horse registered or not.